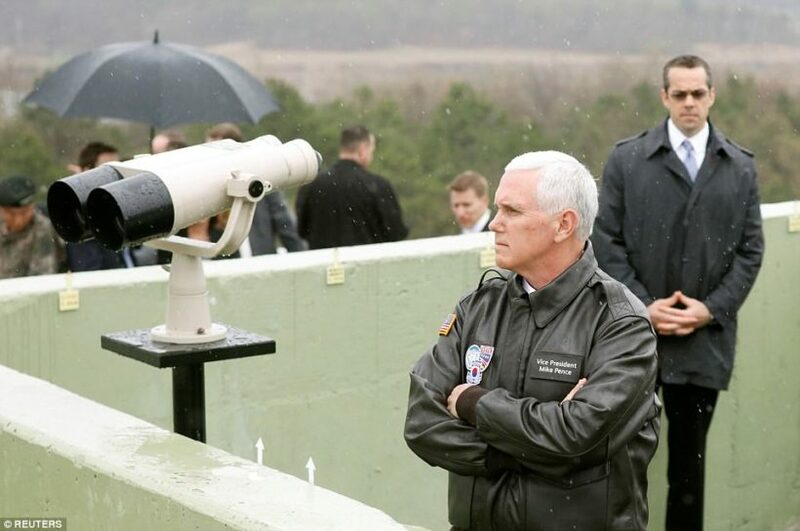 Vice President Pence is seen above looking toward the north from an observation post inside the DMZ (Demilitarized Zone) separating the two Koreas in Paju, South Korea. The visit carries a great deal of symbolism for Mr. Pence personally. His late father, Edward, served in the Army during the Korean War and was awarded the Bronze Star on April 15, 1953. (by Roberta Rampton and Ju-min Park, Reuters) SEOUL — U.S. Vice President Mike Pence put North Korea on notice on Monday, warning that recent U.S. strikes in Syria and Afghanistan showed that the resolve of President Donald Trump should not be tested. Vice President Pence is on the first stop of a four-nation Asia tour intended to show America’s allies, and remind its adversaries, that the Trump administration was not turning its back on the increasingly volatile region. “Just in the past two weeks, the world witnessed the strength and resolve of our new president in actions taken in Syria and Afghanistan,” Pence said in a joint appearance with Hwang. “North Korea would do well not to test his resolve or the strength of the armed forces of the United States in this region,” Pence said. 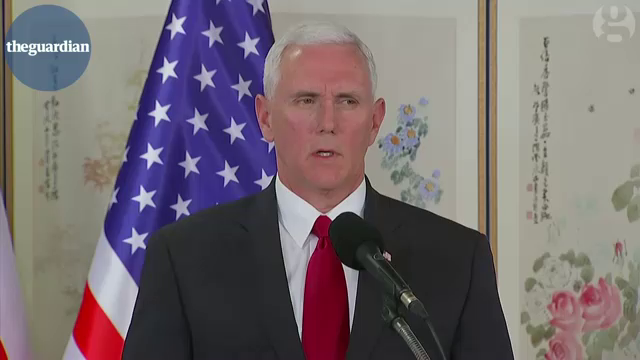 On a visit to the (demilitarized zone) border between North and South Korea earlier in the day, Pence, whose father served in the 1950-53 Korean War, said the United States would stand by its “iron-clad alliance” with South Korea. “All options are on the table to achieve the objectives and ensure the stability of the people of this country,” he told reporters as tinny propaganda music floated across from the North Korean side of the demilitarized zone (DMZ). President Trump’s national security adviser, H.R. McMaster, indicated on Sunday that the President was not considering military action against North Korea for now, even as a nuclear-powered aircraft carrier strike group was heading for the region. “It’s time for us to undertake all actions we can, short of a military option, to try to resolve this peacefully,” he said on ABC’s “This Week” program. The Trump administration is focusing its strategy on tougher economic sanctions on North Korea, possibly including an oil embargo, a global ban on North Korea’s airline, intercepting cargo ships and punishing Chinese banks doing business with Pyongyang. 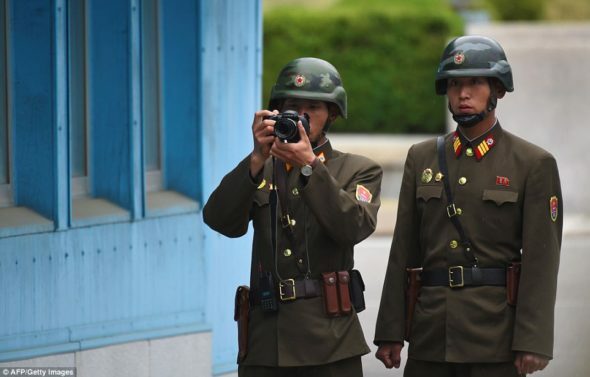 A North Korean soldier takes photographs during Pence’s visit to the DMZ while another soldier from the Communist country looks on. Pyongyang has conducted several missile and nuclear tests in defiance of U.N. sanctions, and has said it has developed and would launch a missile that can strike the U.S. mainland. U.S. officials and experts believe it is some time away from mastering the necessary technology, including miniaturizing a nuclear warhead. 1. What warning did Vice President Mike Pence give North Korea on Monday? b) What did Vice President Pence specifically say during a joint press conference with South Korean Acting President Hwang Kyo-ahn? 2. What steps are the U.S. and South Korea taking in response to North Korea’s defiant nuclear program and missile tests? 3. What is the purpose of Vice President Pence’s four-nation Asia tour? 4. 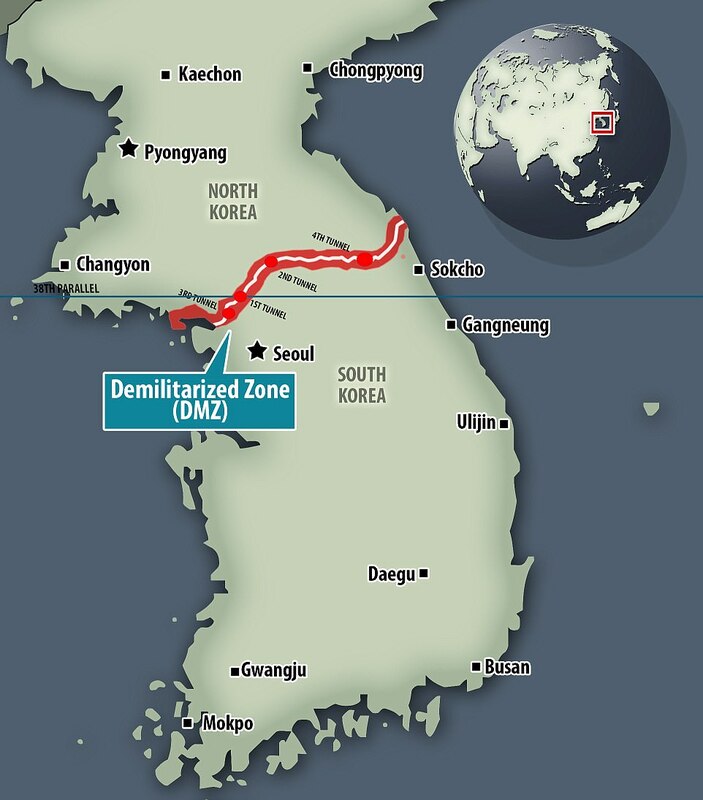 What assurance / warning did Pence make on a visit to the DMZ? 5. a) What did NSA head H.R. McMaster say about U.S. response to North Korean aggression? b) What possible actions is the U.S. considering taking against North Korea at this time? 6. Watch the news reports under “Resources.” What is your reaction to VP Pence’s visit to South Korea and warning to North Korea? (positive? negative?) Explain your answer. b) The “period of strategic patience” did not succeed and instead has allowed North Korea to develop inter-continental ballistic missiles capable of reaching California, as well as proceed in their quest for nuclear weapons. What do you think of President Trump’s stern warning to North Korea? (good strategy? dangerous strategy? better not upset the insane dictator? tough talk is dangerous – better to use negotiations only? tough talk is the only thing North Korea will listen to?) Explain your answer. c) Ask a parent the same question. Discuss your answers. Under the United Nation’s NPT (Non Proliferation Treaty), countries are not allowed to make nuclear weapons (except for the 5 that had nuclear weapons prior to the treaty – the U.S., Russia, China, France, the United Kingdom). Safeguards are used to verify compliance with the Treaty through inspections conducted by the UN’s IAEA (International Atomic Energy Agency). The six-party talks were a series of meetings with six participating states – the U.S., Japan, China, South Korea, North Korea and Russia. These talks were a result of North Korea withdrawing from the U.N.’s Nuclear Non-Proliferation Treaty (NPT) in 2003. North Korea was led [until his death in 2011] by dictator Kim Jong-Il, who starved and imprisoned millions of his own people. His son Kim Jong-Un became the new dictator upon his father’s death in 2011. The aim of the talks was to find a peaceful resolution to the security concerns raised by the North Korean nuclear weapons program. After five rounds of talks from 2003 to 2007, little progress was made. Various on-off negotiations during the Obama presidency made no progress in causing North Korea to end its aggressive pursuit of nuclear weapons and inter-continental ballistic missiles.